Groupe Bluegrass US formé en 1999 à Chapel Hill (Caroline du Nord), composé de Mike Guggino, Charles Humphrey III, Woody Platt, Nicky Sanders et Graham Sharp. Although they received a boost in popularity when actor/banjo player Steve Martin joined their ranks in 2009, the Steep Canyon Rangers had already earned an audience with their progressive bluegrass sound. 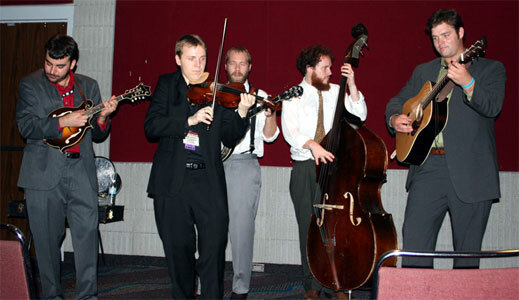 Graham Sharp (banjo, harmony Vocalss) met future bandmates Woody Platt (guitar, lead Vocalss) and Charles R. Humphrey III (bass, harmony Vocalss) in 1999, while all three were attending the University of North Carolina in Chapel Hill. Drawn together by their love of acoustic music, they began playing impromptu jam sessions. As things progressed, they were drawn more and more to bluegrass and started learning the genre's classic tunes. The main impetus to "go bluegrass" was the input of mandolin player Mike Guggino, an old friend of Platt's. He also owned a cabin in the mountains near the school, and the quartet used that as its rehearsal space. At first, there was no thought of being in a band. The members were all busy with school and were planning professional careers. None of them had ever been in a band before, but as they created a style all their own -- equal parts traditional and progressive bluegrass, with a bit of country and rock throw into the mix -- they began to realize they were no longer just a bunch of friends jamming. By the time they graduated, fiddler Nicky Sanders had also joined the band's ranks, and the Steep Canyon Rangers were getting enough gigs to quit their day jobs and become full-time musicians. Although they threw the occasional bluegrass cover into their sets, the main strength of the Rangers quickly became their songwriting. Sharp, Humphrey, and Guggino all contributed to the band's canon with original compositions that appealed to bluegrass, country, folk, blues, and jam band fans. Upon graduation, the Rangers hit the road, playing folk and rock clubs as well as traditional bluegrass venues. Their first album, Old Dreams and New Dreams, was released in 2001 of the band's own label. Mr. Taylor's New Home appeared in 2002 courtesy of the small indie label Bonfire, and the self-titled Steep Canyon Rangers marked the band's first release for Rebel in 2004. Its follow-up, One Dime at a Time, was recorded mostly live in the studio and won the IBMA's Emerging Artist Award in 2006, with the title tune going to number one on the Bluegrass Unlimited chart. Although no stranger to the jam band crowd, the Steep Canyon Rangers further endearIIIed themselves to that audience with a ragtime cover of the Grateful Dead's "Don't Ease Me In." The song appeared on Lovin' Pretty Women, which was nominated for IBMA's Album of the Year, and 2009's Deep in the Shade showed off their continuing love of gospel music. Meanwhile, the bandmates kept themselves busy collaborating with other artists. In 2008, they played with Flatt & Scruggs Vocalsist Curly Seckler, and in 2009 comedian/banjo player Steve Martin asked the Rangers to serve as his backing band on a tour in support of his own banjo album, The Crow: New Songs for the Five-String Banjo. Their 2009 gig at San Francisco's Hardly Strictly Bluegrass Festival introduced the group to a whole new audience of former hippies and boomers, and Martin remained on board for 2011's Rare Bird Alert, which featured guest appearances by Paul McCartney and the Dixie Chicks. Nobody Knows You, the group's debut album for Rounder Records, appeared in 2012. Tell the Ones I Love from 2013, also on Rounder Records, was produced by Larry Campbell and recorded mostly live at the late Levon Helm's studio in Woodstock, New York. With their popularity growing, the Steep Canyon Rangerstoured steadily, both on their own and accompanying Martin. In 2013, Martin collaborated with singer and songwriter Edie Brickell on an album called Love Has Come for You; when Martin and Brickell played a handful of concert dates in support, the Steep Canyon Rangers joined them, and one performance was released in both audio and video under the title Steve Martin and the Steep Canyon Rangers featuring Edie Brickell Live. In 2015, the Steep Canyon Rangersreleased their ninth album, Radio; produced by bluegrass legend Jerry Douglas, it was the Rangers' first set to feature their new sixth member, percussionist Mike Ashworth. Martin's second studio collaboration with the Steep Canyon Rangers, titled Long-Awaited Album, arrived in September 2017, followed in 2018 by the Joe Henry-produced Out in the Open, the group's tenth studio long player. Talents : Mike Guggino : Mandolin - Charles Humphrey : Bass, Harmony Vocalss - Woody Platt : Guitar, Lead Vocalss - Nicky Sanders : Fiddle - Graham Sharp : Banjo, Harmony Vocalss.